Exactly: mainstream media are blaming Chinese and European long-term problems but that hardly looks a realistic explanation when only the Nikkei collapsed today. I would agree that this looks an expression of Japan-specific "unconfessed" problems, which have affected by "contagion" other markets, but only to much lesser extent. Actually if you look at European and US markets: their biggest fall was right at the beginning, sign of unease because of the Japanese collapse. The FTSE stayed almost invariable since then, while the Dow Jones quickly recovered almost all. Well, where do we believe a fair level for Nikkei would be? It can't be 8,000 (December) and 16,000 (two days ago) at the same time. Fair? What does being fair have anything to do with anything any more? Fair to who? If it is to Kuroda, I'm sure the fair level is Nikkei back to 40,000. It was only 23 years ago. 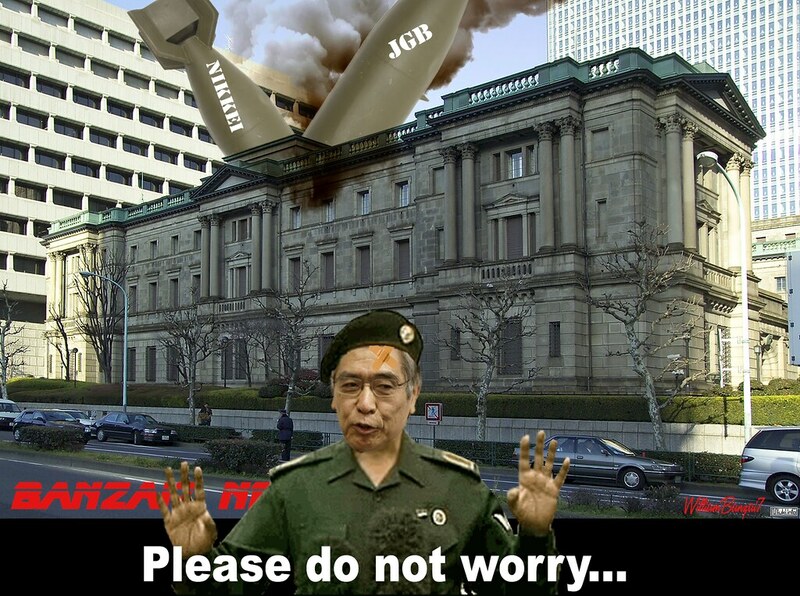 It's only fair that Japan be allowed another stupendous bubble. Where did that Photoshopped genius picture come from? Reminds me of the Star Trek Enterprise plowing into planet Earth. Thanks for your insight and acerbic commentary.